Last month I was down in London meeting up with about 20 or so other audio fans. Everyone had come together to show off their latest and greatest portable gear. Loads of high end stuff was set out for us to play about with, the usual headphones, amps, DACs and DAP's littered the tables, it was a nerds paradise. So it was kind of strange that, on this occasion, the product I came away most impressed with, was a tiny portable bluetooth speaker. It wasn't just me though, a lot of people had been blown away by the Minirig Bluetooth speaker, a modular speaker unit that was pumping out the beats when we arrived in the reception area. The Minirigs bluetooth speaker comes with this included travel case. Its simple and the speaker can play music clearly when the top is open. Something we wish the B&O A1 included out the box. Minirigs are a British company competing in the ridiculously saturated portable bluetooth speaker market. They are designed and built in Bristol, UK and have more than a few tricks up their sleeve that manages to leave the majority of their competitors feeling very underwhelming. A single Minirgs speaker is going to set you back £130 ($150 USD) so they don't exactly come cheap. Despite noting their relatively high price, to me they are one of the best purchases you can make in portable audio right now. Finding a good balance of build quality, portability, battery life and sound quality is a nightmare but the Minirigs seems we have seen to date. Another bonus when buying a Minirig is that their modular design allows you to effectively daisy chain as many individual Minirigs speakers together as you want. They even let you add a separate subwoofer to achieve maximum low-end grunt. Hooking together 2 Minirigs and the sub unit makes a stand alone 2.1 sound system that still remains portable enough to take with you to parties and camping trips. It is an incredibly versatile, well thought out system and one that we think have been grossly overlooked by the audio community thus far. While we do intend to look at a full Minirigs 2.1 portable Hifi system at a later date, this review will concentrate on a single Minirig Bluetooth speaker. We are going to take a look at its design and how it performed under our various tests and comparisons. I don't tend to cover Bluetooth speakers here at Audiophile On but companies do send a lot to our offices. By that, I mean a lot of very average or outright crappy Bluetooth speakers. The majority of the time I won't bother covering them as nothing about them really stands out. So when we do decide to write about one, it means that we think highly enough for us to recommend it for our readers. 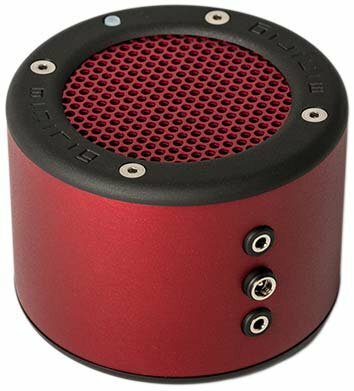 For the past 2 weeks, I have been going back and forth and side by side with all of the best portable Bluetooth speakers I could get my hands on. We have the UE Flip, Roll & Boom, the stunning B&O Beoplay A1, Creative Soundblaster Roar, Gear 4, iLoud and a host of other offerings from China. What we have found is that a single stand-alone Minirig Bluetooth speaker will pretty much outperform anything else of a similar size. Some of these speakers can match but not better the Minirigs in a certain area but they usually fall away when considering them as an overall package. One speaker might sound as good, but then build will be lacking. Another may have solid build but then the battery is less than a quarter of the Minirigs. As a complete product, it's outstanding. For the rest of this review, as mentioned, we are going to be talking about the use of 1 single Minirig speaker being used on its own, without being daisy chained to other units. Essentially we want to look at how the Minirigs perform as a stand-alone portable travel speaker. That said, an individual Minirig, used on its own, is a mono speaker. This is as opposed to a stereo unit that other small portable units aspire to be. This is important because, by making a single unit mono only, Minirigs has been able to fit a larger 3 inch speaker into this device. Other companies try to cram multiple speakers of inferior quality into their units. Here, the 3 inch diaphragm is able to move more air and produce a way better sound and a much fuller and deeper bass response. If you walked by the Minirig Bluetooth speakers on the high street you probably wouldn't have given them a second look. The outer housing is pretty bland, industrial and to the point. It doesn't come across as funky and unique as the UE Flip or as classy and elegant as the Beoplay A1 from Bang & Olufsen. Once you get it in the hand though, you soon realize that Minirigs are serious bits of kit. It is the most robust and best constructed portable speaker I have ever held. The outside is a thick aluminum tube with zero flex in it. Its not the wafer thin metal alloy housings you get on chinese speakers, this feels really strong. It is topped off by a metal mesh grill and solid plastic bumpers. There is absolutely no give in the casing at all, the closest item I could compare it to is a brick. It's solid as a rock, built to last, and to take a beating while providing years of entertainment. . So the build is on point but what about the tech? Well, thankfully there are a fair few tricks on the inside as well. The Minirigs speakers support Bluetooth 4.0 and APTx for a higher level of streamed audio quality. There is also the ability to playback music in your choice of high or low gain modes depending on what your source device is. Used in low gain the device gets adequately loud when used in combination with my Huawei P9 and Iphone 7 but when I pressed the single all-purpose button it switches over to the high gain mode and the Minirig begins to roar. If you don't want to waste battery on your phone or your device is not Bluetooth enabled you can hook up the speaker via one of its two 3.5mm jack ports. The bottom one for low gain and the top with high gain settings. It should be noted these jack points, and the charging port, are extremely well built. There seems to be an obsession with overengineering here and we like it. Other than the single control button that powers the speaker on and off and, as mentioned, switches the gain modes, there are no other physical buttons or controls. There are no pause, play, skip or volume controls so everything will have to be monitored from your source device. This is something that may be a deal breaker to some but since i tend to control my music from my phone I never found it to be an issue. Finally and most importantly we need to talk about the battery life. I was impressed with the Bang & Olufsen Beoplay A1 when I managed to get 22 hours from a single charge. In fact, I was blow away. However, whilst conducting the Minirigs Review I have been getting consistently over 35+ hours of playback from the speaker. the battery life is outstanding, it just goes and goes and what a relief it is not to have to charge it every day. In fact, let's put that in perspective. If I want to take my bluetooth speaker camping and listen to it for 4-5 hours a day I can effectively get a full weeks worth of listening off a single charge. It will easily make a full weekend away and chances are you will have to charge your phone many times before you have to charge the Minirigs. The packaging for the Minirigs is pretty cool. A well-designed cardboard tube that is far bigger than the actual speaker itself. It's got good graphics and plenty of information about the unit that lurks on the inside. Open it up and it's all fairly simple. You get a single Bluetooth Minirig speaker (we chose black but the come in a range of colours)...... and a travel pouch. I still can't work out why other companies producing high-end travel don't include a case (*cough* Bang & Olufsen *cough*) but its inclusion here is a nice touch. The case fits the Minirigs snuggly, not adding much extra bulk and helps add that extra layer of protection on top of what is already an extremely robust speaker. Also included in the package is the usual set of instructions nobody ever reads, a Minirig's branded lanyard, a charging cable (proprietary) and a standard 3.5mm - 3.5mm headphone jack. Detailed, Clear & Full Bodied - The best sounding portable wireless speaker we have heard. The sound on a single Minirig speaker was matched only by the Beoplay A1 in my side by side testing. It managed to get louder and maintain a high level of detail before any of my JBL, Gear4 or Taotronics units started to distort. Even when pushed way past the point of comfortable listening the sound doesn't degrade as sharply as any of those units. The clarity and detail retrieved at normal levels is remarkable for something so small. Treble is surprisingly smooth and never does it get overly hot. There is still a lot of detail in there that makes it a very versatile speaker capable of playing nice with all sorts of genres. The mid-range again has a lot of clarity is very smooth and very detailed. Despite it being a mono speaker there is no hint of compression and instruments and vocals have good amount of spacing. It is a lot more accurate and true to form than the B&O A1 which has a more warm tone to it and better suited to acoustic and rock where the Minirig can play anything well. Guitars and other stringed instruments are resolved with very good speed but little in the way of width (most likely due to the speaker being mono-directional). The bass is just streaks ahead of anything else you can buy within the same size category. Seriously nothing comes close, not even the A1. It's loud, relatively distortion free and has a more than a pleasing level of quantity, sure to get heads nodding indoors or outdoors. As mentioned a trick with small speakers is to place them against a wall or in a corner. This works so well with the Minirigs that people will be scratching their heads trying to work out if the sound really is coming from that little cylinder in the corner. The combination of it being able to get so loud and the quantity of bass from such a small unit is what impressed me most. I thought some of the other speakers that I own from this price category are excellent and any issues they did have could be forgiven because of that eternal struggle of balancing sound, price and size. I didn't expect it to be as markedly different from what I had heard before but it was. The Minirigs is not just a little better, it is a lot better. So where then does the Minirigs potential hit a ceiling? Where does it get to the point that it can't compete? Well, for that answer I would say round about the Helsinki or Iloud. It becomes a matter of size and the amount of air you can move and those two are far bigger speakers with much less battery life. For example, my iLoud speaker is a beast of a Bluetooth speaker truly one of the best sounding and loudest you can get find its price class. It is also a beast in size & has comparably poor battery life to the Minirigs. What would be interesting to me though would be to test out a full Minirigs 2.1 system against some of the other sub $1000 competition and see how far we can really push these things. Of course, there is. In over 500 reviews I have never found a product where something couln't be improved. The only irksome thing for me on the Minirig is that it uses a proprietary charger. Whilst the charging port on this speaker is very robust its still not very convenient if you were to lose the original cable you would have to order another as opposed to just using a standard Micro-USB like you find on other speakers. Not an issue for me but worth mentioning for others is the lack of physical playback controls on the speaker itself. That and the lack of a microphone for conference calling (something that I have yet to see anyone use). The thing you notice on the Minirig is that any of the cons you will find are far outweighed by the pros. As mentioned I usually just don't bother with Bluetooth speaker reviews. Not unless I feel that I have found something special enough to share with our audience that is pretty obsessed with sound and very picky on performance. Thats possibly the biggest compliment I can make to the Minirig's. That they sound so good, that they performed so well in the build and battery tests that they managed to earn their way onto our site. For some price will still be a little bit too steep but for me, this is the perfect balance of price, performance and all around quality you can get. With all that said couldn't help but give the Minirig's speakers our Audiophile On Gold Award.